This is probably the best quinoa salad you will ever eat. It is everything you wanted in a grain-based salad – soft, crunchy, sweet, and tangy. It is so good that I chucked my “no-leftovers” mentality to the curb and ate it for days on end. I was first introduced to the original version quinoa salad at the huge anniversary celebration for the nutrition program at my grad school. The last event of the day was a cooking demonstration by a chef specializing in healthy tailgating. 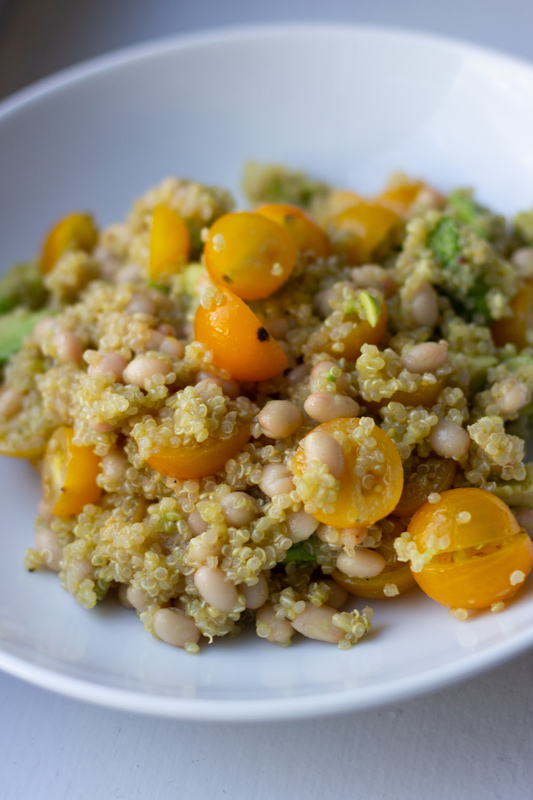 This quinoa salad was her take on pasta salad, but with more nutrients/no mayo. While I do eat quinoa, I will not actively seek it out for meals. But I remember eating this salad and saying, WOW I NEED TO MAKE THIS AT HOME ASAP. Of course, I got wrapped up in the weekend with my friends… and totally forgot about this salad. Until my friend J made it a few weekends ago during my semi-annual trip up to my old stomping grounds. As we sat there and devoured the whole bowl, I picked her brain for the recipe. And promptly made it the first night back in my place. And it could not be easier to make. It started with making a batch of quinoa. I always make my quinoa with chicken broth, but you can sub water or veggie broth to make it vegan! Quinoa cooking is very similar to rice (one part quinoa to one part liquid), but you need to let it steam off the heat at the end to help it get its yummy fluffy texture. When the quinoa is cooked, you just need to assemble the salad. 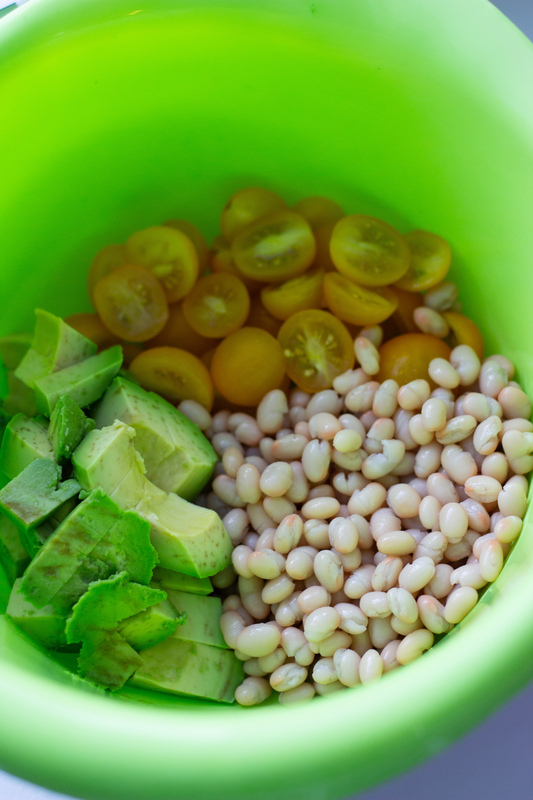 In a large bowl, add in some cherry tomatoes (I buy the super sweet ones that are available year round in the grocery store), canned/drained/rinsed white beans, and some avocado. Then toss in the cooked quinoa. Stir everything to combine and then add a drizzle of olive oil and a good splash of red wine vinegar. Taste and season with salt + pepper to your preference. It’s the perfect weeknight dinner and the leftovers are EVEN BETTER the next day! AKA a dinner winner in my book! In a small pot, combine rinsed quinoa, water/broth, and salt. Bring to a boil and then reduce to a simmer. Cook the quinoa for 10-12 minutes, or until all the liquid is absorbed. Remove the pot off the heat and then place a lid over the pot, allowing the quinoa to steam for 5 minutes. Then fluff using a fork. 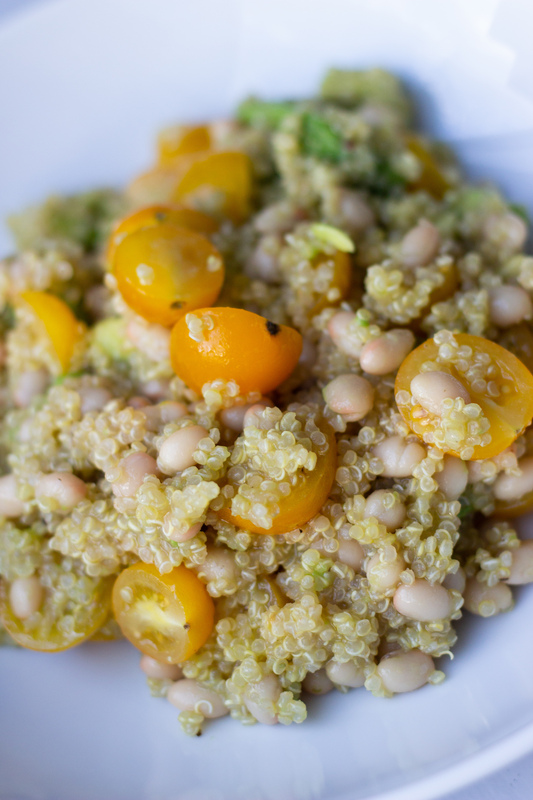 In a large bowl, combine quinoa, tomatoes, avocado, and beans. Toss to combine. Drizzle over olive oil and vinegar. Taste and adjust vinegar to your preference. Add salt and pepper to taste. Serve immediately or allow to cool completely before storing in the fridge in an airtight container!